Tigerland is a low-budget film, at least in the standards of war films. The quality is sometimes purposefully grainy, almost giving the film an aged look to bring us back into the world of the 60s. For this reason alone, it may seem that there is no reason to have Tigerland in high definition, but there is much more to this film than the quality of the footage or the size of the budget. This was Joel Schumacher’s redemption for the destruction of Burton’s Batman franchise. This was also a powerful film in the career of Colin Farrell. He was already a rising star, but this film launched him to the top of the list for a few years. Recently the actor has gone back to making more films like these, and less like Miami Vice. 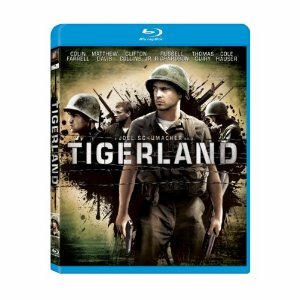 Tigerland features Farrell as a resistant young military recruit on his last stop in preparation before being shipped out to Vietnam. Roland Bozz (Farrell) is an independent person, something which is not possible in the army. He resists his commanding officers and his platoon, causing him trouble at first. When the platoon is sent to Tigerland, the final training ground before Vietnam, Bozz’s independent nature becomes an asset for his platoon in their final days of preparation. The Blu-ray release comes with a somewhat unnecessary but still indulgently worthy high definition presentation of the film, as well as some new special features. The commentary track by Schumacher is taken from the DVD release, as are the making-of featurette and original casting sessions with Farrell, but there are some new features included as well. The Blu-ray artwork is also highly improved from the DVD release.